A large workstation desk in Walnut veneer with black Marmolium desk surface and solid Walnut edging for Cranc Post Production in Cardiff. 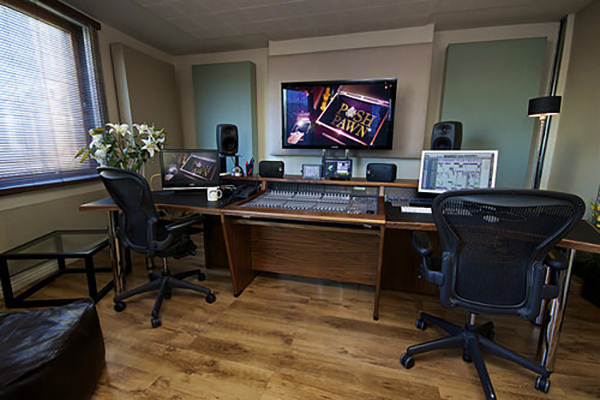 The desks houses an Avid C24 control surface and has a wing table to each side with large working areas and easy access to the 19″ outboard racks. I’m delighted with the 2 studio desks that John designed and made for me. Two years on they still look as good and work perfectly. John made sure that they were right in every detail. I totally recommend him. High quality bespoke studio furniture. John came over and put it all together for me. I can’t recommend StudioRacks highly enough! We needed some custom-made, hinging racks due to space constraints within the studio. John transformed a poor sketch of mine into a piece of furniture that compliments our studio perfectly. Upon delivery, John installed the racks and cut all necessary cable entry holes. I couldn’t be happier with the service we received from Studioracks.co.uk. I thoroughly recommend them. We looked at a number of manufacturers before settling on John at StudioRacks. He sent us samples of the different finishes available, enabling us to select the best match for the intended location of the rack, delivered it on time, and we are very pleased with the result. Just wanted to let you know that the rack arrived today, in good condition, and looks great! Many thanks for a perfect job and spot-on delivery – Excellent! I’m really pleased with the racks John built for me. They look great, the build quality is brilliant, and they’re extremely good value. John’s attention to detail and excellent service were really appreciated too. StudioRacks have designed, built and delivered numerous bespoke units for my studio, on each occasion improving on my original concept and delivering something better than I had hoped for. A pleasure to deal with! The desk has proved to be excellent. StudioRacks were just fantastic. My furniture was built exactly to specifications in just a few days and I was sent samples of the various finishes so I could make sure it would fit in well in my studio. Would not hesitate to use them again.